I got my rifle back from Tony the magic-fingered air-gun maestro at Sandwell Field Sports last weekend - and then promptly came down with a cold. So, this last week, instead of exploiting the vastly improved rifle out in the fields I've mainly been blowing my nose in front of the Playstation and eating a lot of oranges. 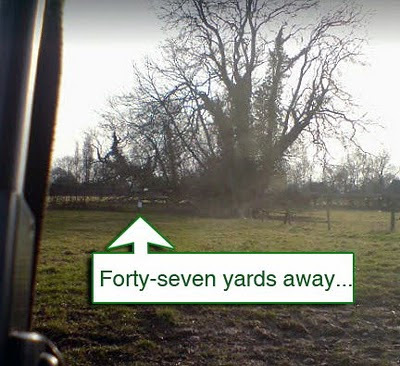 I did venture out briefly yesterday, though; I sat up against a fence and shot some pellets right across the whole 47-yard width of a field at a tiny target I'd stuck up on a post opposite. Since I felt so ropey I only stuck around long enough to fire a very small group, but the results cheered me up a good deal. These are the first four pellets that I fired on the day after staggering across a boggy field with a cold; a damn-near fifty-yard shot that resulted in a group a little more than one inch across. Not bad for the first few shots from a woozy bloke with an old springer, I thought. Courtesy of Tony's workmanship my old .22 HW80K is now proudly sporting a spanking new barrel from an .177 HW95. 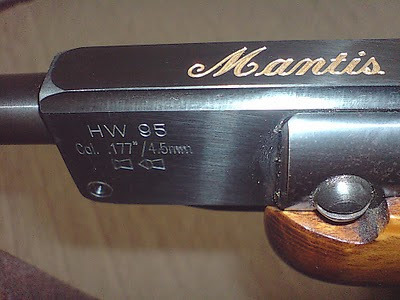 The barrel had previously been rather nattily inscribed in gold with the word "Mantis" and since I spend so much of my time in the fields asking the good Lord to help me shoot a bit better I wondered if I ought not risk a dodgy pun and dub it the Praying Mantis? Well, no - that's pretty bad, isn't it? It's now a subtle amalgam of HW80 and HW95 so I reckon that has to make it an HW87-and-a-half. What do you think? Me thinks Hubert, that ‘preying mantis’ may well more be apt, especially after a good pattern like that. Hope that your well enough soon to be able knock a few of them wabbits off. Good grouping. My family home in West Sussex was built in 1740, it was called High House. It had cellar, ground floor, first floor, second floor, and attic. My bedroom was on the top floor. The windows were set into really deep sills so there was plenty of room to actually sit on/in the window sill. On really wet windy days I would sit up there and read, or if I was sick I would wrap up and sit there with my .22 BSA springer close to hand! Below was our large garden, which included the cabbage patch! I could wack the wood pidgeons from this high perch. One day I glanced out whilst reading to see a very large pidgeon eating the cabbages. I sneaked the window open and took my shot. Nothing happened. The gun fired ok, but not a flinch from the pidgeon. I think I took about 6 or so shots and then went down stairs to check it out. It did not move as I approached, and when I lifted the bird up, there was a single hole right through it you could have passed a sixpence through!!! Looking forward to reading about you making a substantial dent in the rabbit population this year! Also, your decision to go .177 from .22 -- did you blog about that? Be curious to hear why. I have my theories, of course. Thank you all for your kind comments, folks. Yes, SBW, that would be a cool thing indeed - we'll have to sort that out someday soon. Nice to hear from you again Albert. I've been trying to leave comments on your blog but for some reason there often seems to be a glitch that stops me - I suspect it's chiefly to do with the hopeless bandwidth of my current string-and-glue net connection. LeLoup - that sounds like rather an idyllic childhood to me! It's always nice to have your comments here. Bpaul - I started to reply to you in the comments box and then realised that this was the makings of a longer piece, so I've included your question in my latest post - I hope this is O.K. It is a tricky thing this power versus trajectory. In the late 18th century they were using large caliber air rifles. 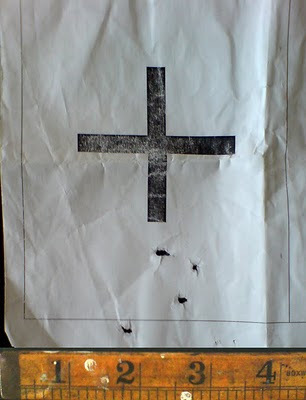 I believe Napoleon banned air rifles and introduced the death penalty for anyone found using one. They were so quiet and lethal. I would love to get a .22 round ball mould one day and try them out in my BSA air rifle. It would be very interesting I think. Now that you've had the .177 for almost 2 months, how are you finding it for hunting? I have to confess that in the last few months I've done very little hunting. I've been doing full-time voluntary work in a local bicycle recycling project; getting home late, pooped and covered in bike gunk I've found the will to get out into the fields distinctly lacking. The brighter Spring weather and the longer evenings has freshened my interest though and I went out recently and put in an hour or two getting properly zeroed and re-acquainted with the rifle and the fields. Last night was the first time I went out properly and I returned in pretty short order with the makings of meal. A rabbit came out of a hedge just under 10 yards away from me after I'd lain in wait for about five minutes and the shot - aimed on the cross-hairs - went home perfectly. Since I'd zeroed at thirty-five yards this did seem to me a confirmation of the flat trajectory of the .177 between 8 and 40 yards. So this bodes well, really. I'm not yet too sure how effective the smaller pellet will be with wood pigeon - so the jury's still out on that one for a while.